Assistance teams comprise a number of specialists from a variety of relevant disciplines who visit an area and take part in a participation process (for instance, a planning weekend). They are particularly useful for providing a fresh and independent viewpoint. Assistance teams are invited in by local people or agencies and provided with a brief. This may be simply to listen and advise, or to act as facilitators. Teams will normally be multidisciplinary and be led by a team chairperson. Team members are often paid expenses only, to ensure independence. If they are paid a fee, this needs to be made clear. The team will usually prepare a report with their recommendations before leaving. Duke Street, Liverpool, UK, 1997, Nick Wates. Team members discuss options with a local landowner. Good briefing beforehand is essential; on both content and process. Strong leadership is vital to keep events moving forward. Give team members roles to focus people's energy. Get each team member to supply quotes (soundbites) and recommendations to standard bullet point format, in 3 categories: Background; issues; recommendations (to make sure they listen and provide evidence of their contribution). Ensure that team members commit themselves to attending for the whole event. Main costs for team: Travel; accommodation; meals; film; equipment and supplies. Sample process for drawing up proposals after public workshops or planning day. Team only. Determine tasks, report structure and division of roles. All workshops analysed to standard format summarising points made and identifying key themes. Proposals drawn up to standard format (heading plus one summary paragraph). Non team members return (eg local enthusiasts) to make comments. Open workshop session to discuss any major omissions or controversial issues. Clothes with lots of pockets for camera, notebook, pens, etc. 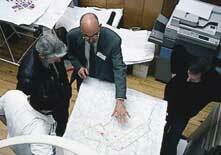 For large action planning events where the team is facilitating and preparing a report. Several compatible roles may be taken by one individual. Not all roles will be needed in every event. Customise. Keep names and phone numbers of useful resource people. Liaise between different workshops to create linkages. Ensure follow-up takes place and publicise. Ensure key events are photographed (slides and prints). Commission, gather and edit copy and illustrations. Liaise with printer and photo lab. Record key sessions and index. Co-ordinate pool of people for errands etc. Provide leadership, orchestrate event, take responsibility. Keep roving eye on group dynamics, reporting back to team chairperson. Steer workshop sessions (one per workshop). Prepare notes of workshops in format for final report. Checklist of skills and professional backgrounds likely to be useful. Customise for each event. "We owe thanks to all our 'outsiders'. They were so friendly from the start. It was like one big happy family." Local resident, Ore Valley Action Planning Weekend, 1997.